One of the finest 1970 Chevrolet Chevelle LS6 convertibles will be up for grabs at Mecum’s 2017 Indianapolis auction. This award winning big block brute will cross the auction block on May 20th. This Cranberry Red with black stripes Chevelle was treated to a concours restoration courtesy of Cam’s Classic Restorations in Vancouver, British Columbia. The engine was also rebuilt by Terry Bride Racing Engines and Machine in nearby Richmond. This ragtop beauty looks like the day it rolled off the assembly line. Under the hood, you’ll find the heart of this behemoth. The LS6 454 was laughably rated at 450 horsepower and most Chevelle devotees know the true output was much higher. Many consider the LS6 454 to be epitome of GM muscle from the early 1970s. Few dared to challenge the LS6 at a stoplight drag race. This Chevelle is also heavily optioned with goodies such as an M22 four-speed manual transmission, F41 suspension, and ZL2 cowl induction hood. Inside, options include an AM/FM 8-track radio, power windows, and bucket seats with center console. 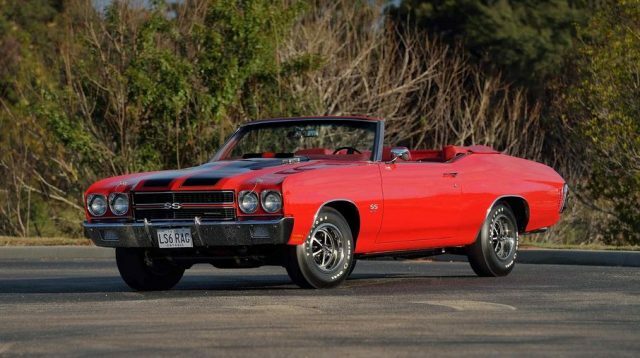 If you’ve looking to score a great Chevelle SS, this just might be your chance. Update: This 1970 Chevrolet Chevelle SS sold for $385,000.